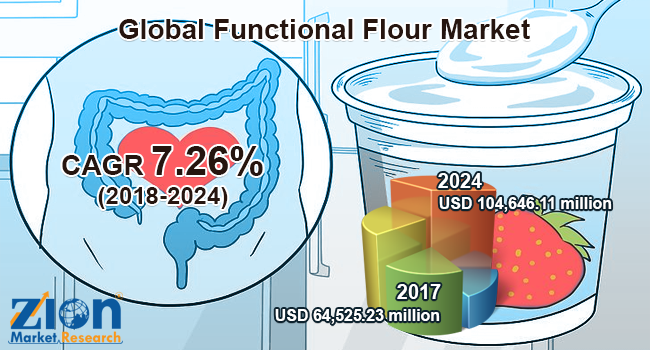 Global functional flour market expected to reach approximately USD 104,646.11 million by 2024, growing at a CAGR of around 7.26% between 2018 and 2024. Functional flour is a sort of flour that is produced by enhancing the nutritional values through different procedures, for example, blending, wheat breeding, and others. The report covers forecast and analysis for the functional flour market on a global and regional level. The study provides historical data along with a forecast from 2017 to 2024 based on value (USD Million) and volume (Metric Ton). The study includes drivers and restraints for the functional flour market along with the impact they have on the demand over the forecast period. Additionally, the report includes the study of opportunities and threats to functional flour market on a global level. To understand the competitive landscape in the market, an analysis of Porter’s Five Forces model for the functional flour market has also been included. The study encompasses a market attractiveness analysis, wherein raw material segments, application, and product type segments are benchmarked based on their market size, growth rate, and general attractiveness. The study provides a decisive view of the functional flour market by segmenting the market based on raw material, applications, product type, and regions. All the segments have been analyzed based on present and the future trends and the market is estimated from 2018 to 2024. Based on raw material, the functional flour market is segmented into legumes and cereals. Based on application, the functional flour market is further segmented into soups & sauces, bakery, and R.T.E. products. On the basis of product type, the functional flour market is classified into pre-cooked flour, fortified flour, and specialty flour. The regional segmentation includes the current and forecast demand for North America, Europe, Asia Pacific, Latin America, and the Middle East and Africa with its further bifurcation into major countries including Germany, France, the U.K., the U.S., China, Japan, India, and Brazil. Some of the key flour milling & processing associations include National Association of British and Irish Flour Millers, North American Millers' Association, and European Flour Millers. Regulatory associations and government bodies involved in the functional flavor manufacturers include EFSA (the European Food Safety Agency), FDA (the Food and Drug Administration), FSANZ (the Food Safety Australia and New Zealand), and FSSAI (the Food Safety and Standards Authority of India). Some of the key players involved in the value chain of functional flours are General Mills, Inc., SunOpta, Inc., Archer Daniels Midland Company, Cargill, Incorporated, The Hain Celestial Group, Inc., Associated British Foods plc, Parrish & Heimbecker, Limited, AGRANA Beteiligungs-AG, The Scoular Company, and Bunge Limited. The report includes detailed profiles including the financial overview, business strategies, key developments, company overview, etc. of key players operating in the global market. Few major strategies of the companies operating in the functional flour market are merger & acquisition, product launch, backward & forward integration, etc.